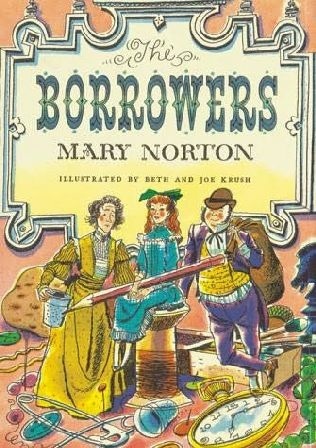 I love the series The Borrowers, by Mary Norton. It’s whimsical without being overly twee, it’s exciting, it’s clever, it’s Edwardian with a little modern edge. The illustrations, by Beth and Joe Krush, are clever, detailed, and delightful. How I love adventurous Arrietty and her nervous parents – especially her mother, Homily, who is the most timid member of the family and yet shows the most backbone when push comes to shove. This book and others in the series are children’s books that adults can enjoy – indeed, as I’ve grown older, I find more to love in them every year. These books describe the lives and adventures of Arrietty, her mother (Homily), her father (Pod) and various other characters who come in and out of the story, both human and Borrower. The Borrowers are tiny, tiny people who live secret lives. They prefer old houses with no pets or children, where there is an abundance of both clutter and routine. They live secret lives, and they don’t grow food or hunt animals or make anything from scratch. They borrow. So when you lose little things – buttons, safety pins, that kind of thing – the Borrowers took it. The walls had been papered with scraps of old letters out of waste paper baskets…On the walls, repeated in various colors, hung several portraits of Queen Victoria as a girl; these were postage stamps, borrowed by Pod some years ago from the stamp box on the desk in the morning room. There was a lacquer trinket box, padded inside and with the lid open which they used as a settle; and that useful stand-by – a chest of drawers made of match boxes. The Borrowers is also an ode to the importance of creativity and change. The family experiences “a golden age” of Borrowing when they get access to the doll’s house, but it doesn’t make them happy (Pod in particular becomes terribly bored) and it leads them into terrible trouble. They feel safe in the old house, unlike their relatives who all “emigrated” and whose fates are unknown – but in the safe house there is also stagnation. Who will Arrietty marry? Will the Borrowers die out altogether? Taking risks jeopardizes their immediate safety but makes their long-term safety possible. It’s a cozy series about the value of not being too cozy. There are several editions of course, and movie adaptations, but do get the version with the illustrations by Beth and Joe Krush. How can you resist? This entry was posted in Book Reviews and tagged Beth Krush, classic children's books, Joe Krush, Mary Norton, The Borrowers. This was one of my favorite books when I was a kid. Whenever we couldn’t find something, we would always say that the Borrowers must have it, and then we would try to figure out what they would be using it for.